It is said that we are like a White canvas when our soul enters this world on which life writes our story. The color White is pure. It connects us to the angelic realms and the divine. So, what does the color white mean to you? Are you on a spiritual journey? Is your path one of a lightworker? Why did White lead you to BuildingBeautifulSouls.com? In the world of symbolism White is the color of purity and flawlessness. It also represents virtue, fullness and new beginnings. Unlike some colors White isn’t necessarily exhilarating. Nonetheless the “White light” spoken of in New Age concepts connects us and directs us to the divine. When witches visualize protective light it’s typically White. 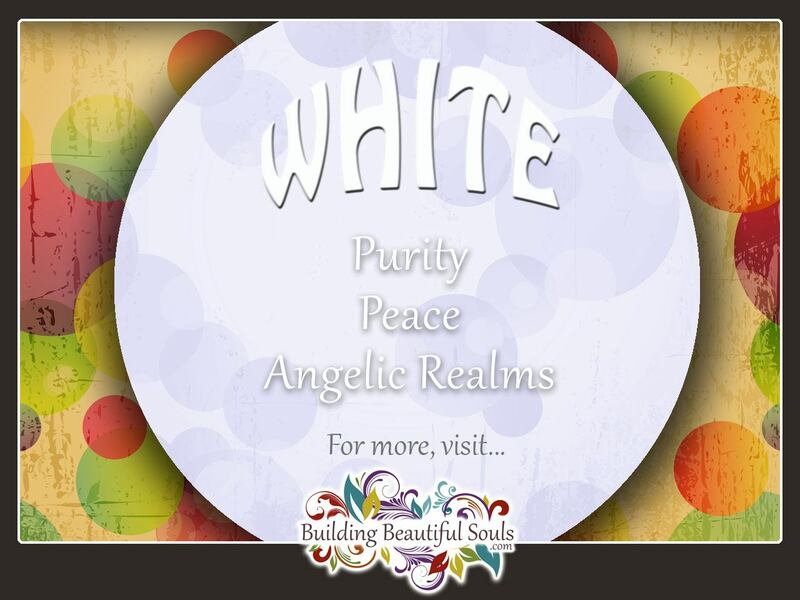 White embraces all colors, and creates a vibrational doorway that represents all possibilities. White liberates and expresses sound judgement. Spiritually speaking White is an amplifier for not only magic but our personal awareness. It is the color worn by many brides as well as medical personnel to imply spotlessness physically and mentally. The meaning and symbolism of White has a lot to do with how it makes us feel. It’s a peaceful color that also reflects light into dark rooms. It offers hope and relief from stress. White is “tidy”, clean and refreshing. However, White should be used with caution to avoid a sense of barrenness, immobility or flat emotions. In the Far East White represents death and transition. It is not always a literal death but rather ending one cycle and starting something new. It may be a job, a relationship or even a child. Other common associations for the color White include being open, offering fairness, a return to simplicity and neatness. Research shows that people usually don’t favor White their whole lifetime. An attraction to White typically comes during changes – endings and beginning when life takes on a whole new chapter. So if your favorite color is White right now, expect some type of transition after which your attraction to the color may wane in favor of another. This is natural, and can give you greater insights into how your evolution transformed your personality. During our White “phases” we find that we have a strong desire for keeping things tidy. Everything from your clothing to your closet must be pristine or it throws you off balance. This applies to personal hygiene too. The idea of a day without a decent shower is inconceivable, not simply for you but for anyone with whom you associate. The White warrior has a very upbeat attitude and thinks heavily about the future. People see them as the practical one in a group who errs on the side of caution, particularly with finances. Even though White has future vision, they are reluctant to act spontaneously. Rather everything in White’s world is carefully measured before making a decision. Patience and self-reliance are your middle names except when you see others acting in a manner that throws caution to the wind. White people measure themselves harshly for anything perceived as less than flawless. They may often seek out alone time because relationships can become too complicated for your taste. You are also not a rogue in the bedroom, being wary of not measuring up to others’ (or your own) expectation. The key to good relationships for White is being able to communicate your longings honestly to your partner. Those who dislike the color White are very unstructured and unplanned. If a few things are out of place, oh well! The anit-White people seek adventure often aiming for a bit of mischief along the way. In color psychology, the symbolism and meaning of White splashes over many of the personality representations. White reminds us of the innocence of our youth, cleanliness and clarity. It’s a favorite color in hospitals because it decreases anxiety and improves hope for the future. In group settings White stresses oneness, impartiality and balance. Stories tell us of the White knight who risks life and limb to save those in distress. When our life changes dramatically we talk about having a White slate on which to start over again, with fresh ideas and energy. Some people dislike White because it feels sterile and cold, yet in religious settings White is often the color we think of in visualizing Angelic beings or peace. Designers use White in rooms that feel oppressive and small. White can have “tinges” of other colors but still appear fairly bright. Gray is certainly one variation that muddies White’s waters, being a more uncertain, “iffy” hue. Silver-White is a good spiritual color representing attainment and awareness. White healing crystals and stones infuse the energetic field around them with divine love and vibrations of the highest intention. White healing stones and crystals can bring peace and clarity to negative situations as well as soothe antagonistic persons. Cryolite – soul contracts, sacred purpose, divine truth. Dolomite – peace, focus, meditation. Howlite stress relief, calms the monkey mind, said to help insomnia. Moonstone – lunar energy, intuition, feminine divine. Opal – chakra balancing, prophesy, true wealth. Quartz – energy amplifier, energy clearing, programming. Selenite – opens connection to & communication with Spirit. White Camellia – longevity, desire, perfection. White Carnation – ‘flowers of the gods’, unconditional and pure love. White Chrysanthemum – enduring friendships, loyalty, devotion. White Daffodil – vitality, creativity, inspiration. Daisy – innocence, playfulness, simplicity. Dandelion – wishes come true, whimsy, messages from Spirit. White Larkspur – happiness, humor, full heart. White Calla Lilly – faith, purity, overcoming challenges. White Lotus – rebirth, eternal life, spiritual awakening. Magnolia – freedom, soulmates, past lives. White Oleander – seduction, magic, focus on the future. White Orchid – desire, eternal love, fertility. White Rose – presence of angels, moon energy, highest vibrations.